There is no time capsule as scary as a results sheet — like this one from Saddleback Park on February 2, 1982. That was 35 years ago. Look at it carefully to see these 12 pertinent facts. (1) Tony Alessi was racing the Mini Junior class. Thayne Zito won. (2) Mark Toyama won the Mini Intermediates in front of Steve Skibell. (3) Paul Denis, Kurtie Henricksen and Todd Campbell were the Mini Experts that day. (4) Did you see J. Bacon in the 125 Junior class. That’s Jim “Bones” Bacon. Also, the 19th place rider is Yamaha’s current team manager Jimmy Perry. (5) The 125 Intermediate class was packed with Rob Engel, Michael Horton (now Michele Horton), Ty Swartz, Gary Renko and Jody Weisel (he was already 35-years-old back then). (6) That’s Rusty Hannah winning the 250 Intermediates not Bob Hannah. (7) Frank Thomason, the REM promoter, was fifth in the 500 Junior class. (8) The 125 Pro class was won by Mike Beier, Doug O’Donnell was third, Tony Gomez 11th, Ray Tetherton 12th and Doug Dubach 13th. (9) Matt Tedder was third in the 250 Pro class with Steve Pfaff fourth, Glen Senecal 12th and Monte Roy 17th. (10) Bruce McDougal won the 500 Pro class with Frank Steiner second, Jimmy Roy fourth (Jimmy and his brother Monte would go on to lasting fame as the Floyd Brothers in countless Jody’s Box columns), Carl Gazafy was fifth and Brian Fry seventh. (11) Recognize anyone else? We see Scott Slayton, Joe Melton and Art Oliver (dog not listed). 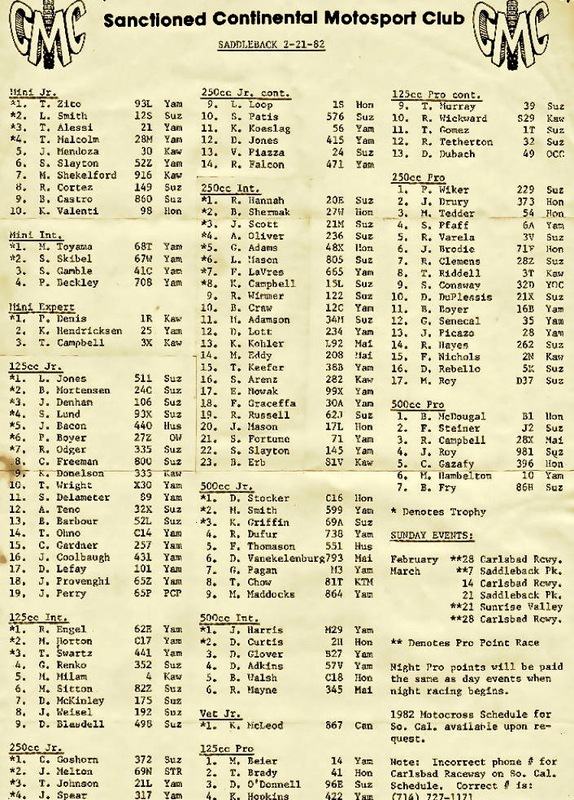 (12) Even though these results are 36 years old — here is a quick list of the 13 riders still racing today (5 of the 13 came from Saddleback’s 125 Intermediate class): Rob Engel, Steve Pfaff, Ty Swartz, Michael Horton, Glen Senecal, Gary Renko, Jody Weisel, Frank Thomason, Doug Dubach, Matt Tedder, Frank Steiner, Carl Gazafy and Joe Melton.